Spain’s culture of celebration is certainly not limited to the telluric benefits of established holydays but also includes a strong predilection for commemoration. Among Spain’s national monuments , which visitors should not miss, is the Tower of Hercules, an ancient lighthouse located in La Coruna Harbour and dating all the way back to Roman times. Another vestige of ancient times is the church of Santa Maria de Lara, one of the only Visigoth churches still standing in Spain. It was built in the vicinity of Burgos and is estimated to have been built around the year 700. Two Roman mausoleums can also be seen , at Cordoba (dating from the 1st century AD) and Fabara (built during the 2nd century AC), the latter being particularly well preserved. 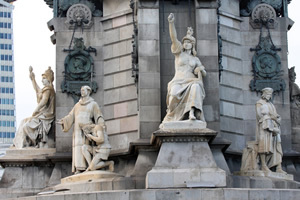 In Barcelona, you can find various, such as the Columbus Monument, nearly fifty metres tall altogether and a crafty representation of Christopher Columbus pointing towards the Americas. Always regarded with sombreness and an incursion into history, the memorial known as The Valley of the Fallen was constructed during the dictatorship of Francisco Franco to honour those who died in the Spanish Civil War. It can be found near Madrid, in the Sierra de Guadarrama mountain range. Quite outlandish in the heart of Europe and definitely worth exploring is the rich Moorish legacy left in Spain, which includes many constructions of great artistic beauty, such as palace known as the Alhambra, located in Granada, Andalusia, also referred to as ‘’The Red Fortress’’ and considered a national monument. You can also visit the ruins of the ancient city of Medina Azahara, near Cordoba, built for a caliph between 936 and 940 and destined to oblivion for almost a thousand years. Perhaps the most visited Moorish monument however is an 11th century military fortress known as the Alcazaba of Malaga, due to its excellent condition.